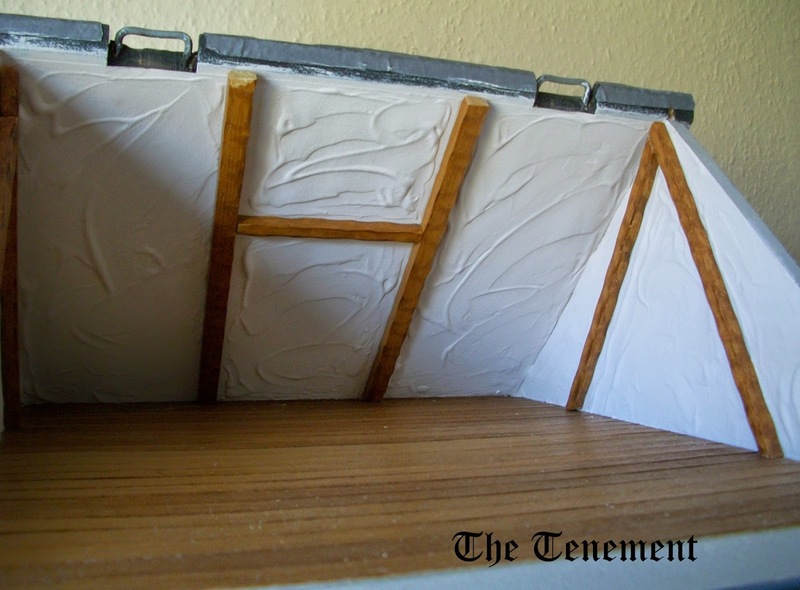 Progress is slow at the moment with this project but things are happening, albeit small things. The attic space now has beams. I'm afraid my Cobbler is going to be vertically challenged as the height of this space is only 5.5" (13.97cms). I've already mentioned previously that I was struggling with my Cobbler until I mentioned the dilemma to a fellow mini-mate who put it into perspective for me. I had been undecided between a 17th Century cobbler and an 18th Century one given that the Tenement covers those two particular periods. "Go with the shoes" she said! I duly looked out the shoes I had already purchased and yes, the answer was already there - he's an 18th Century cobbler (thanks Jonquil). Isn't it funny how we can't always see the wood for the trees? Decision made, I set about making him (Mr Bennett*) a cobbler's bench. 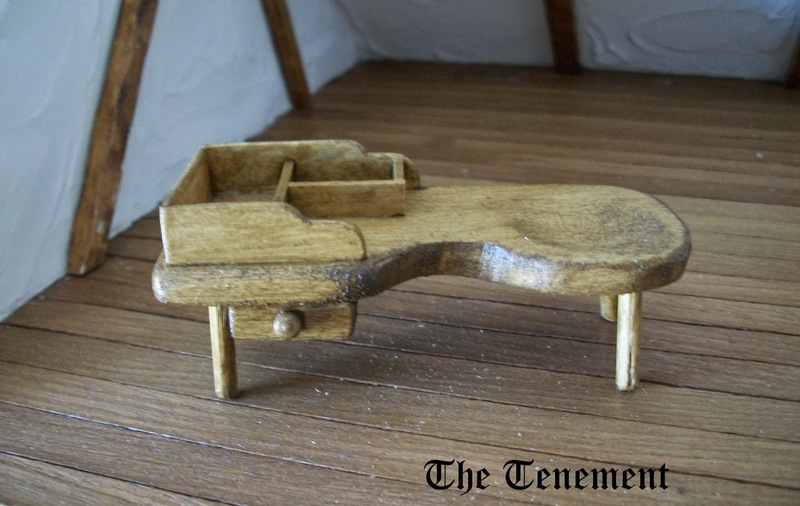 I'd seen cobbler's benches available for sale - some basic, some grand - but thought I'd have a go at creating my own. 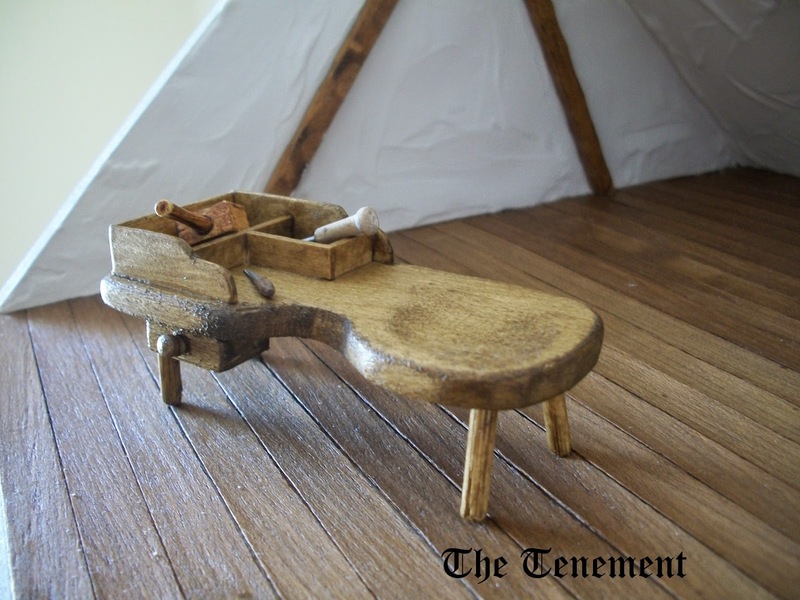 Once you have the measurements for items like this, it's easy enough to get whittling. It also gets round the issue of him not having a 'stand at' workbench which wouldn't have worked given the height of the room and the space available. I had already purchased a few tools from various fairs. *Crafted into the stonework on the outside of the RL building - although a bit difficult to read - are the words "Bennett, Shoemaker". 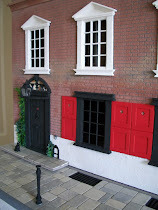 I haven't found out yet exactly when Mr Bennett occupied his premises but it certainly wasn't during the 18th Century. I just thought it would be fitting to call my cobbler this as a "homage" to the resident tradesman. 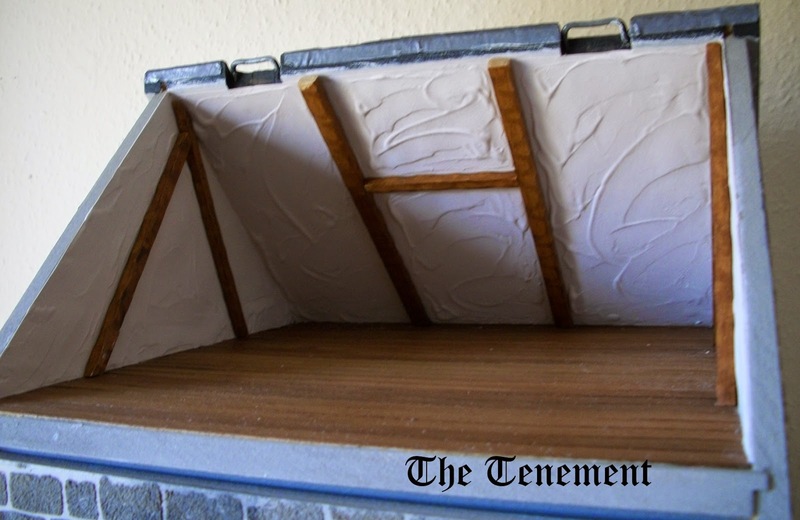 The attic is a very interesting project. I can't wait to see the shoes. Hi Irene! Isn't it funny how we can collect things randomly, just because we like them and then find that we have accumulated enough to build a larger project around them? Wow Irene, the bench looks unreal...the attic room will be just wonderful, I know! The beams and finish are making this attic space more real. It's great to see a new post! The cobbler is a great idea and I can't wait to see it evolve. The bench is wonderful and so well crafted. Again, your precision to detail is what sets your work apart. Nice work on the bench - it looks just like a real antique! Looking forward to seeing more. Good work Irene. Your little bench is gorgeous and I think the finish is perfect. Your little table is so cute! I like the idea that you made it so he could sit. I like workers who sit. It seems they are relaxed and enjoying the craft more. You've made a great start Irene! The bench looks fantastic.... so worn and used! I always assumed that cobblers worked sitting at these benches rather than standing! It definitely makes it easier it the tiny attic. I can't wait to see what you make next!